Do Pirates Improve with Age? We all love to listen to our favourite song over and over again. Many of us can recite the lines from our favourite movie even before the characters on the screen deliver them and we all know the power of rereading favourite books, as each time we encounter a memorable passage, we bring new meaning and a deeper appreciation of why it resonates with us. But what about watching the same guest speaker deliver the same message three years later? 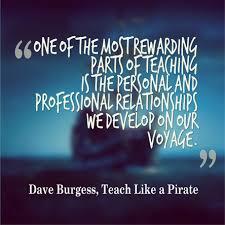 This past week, I had the opportunity, to once again, welcome Dave Burgess ~ from Teach Like a Pirate fame to Thames Valley. Unlike his last visit, where we invited him to present to a number of full school staffs, this presentation was shared with all of our K-12 Learning Coordinators, our Instructional Coaches and their invited classroom teacher guests. I reread my post from his April 2013 visit and was surprised at what resonated with me then and how it compares to this week’s reflection. For this visit, I will admit that I was a little anxious in that the audience (our system staff) have a very refined palate when it comes to professional learning. They are the ones who are on the leading edge of inspiring other educators, highlighting best practice and demonstrating finely tuned presentation skills. But, within minutes, Dave had the entire audience in the palm of his hand (as he used sleight of hand to achieve his first magic trick). I was purposefully watching the reactions of some of our team members ~ those who would be looking for depth of message beyond the multiple lingerie bags, raw steaks and the large gold earring. Through the smiles and the nods of agreement, my worry dissipated. Follow up conversations lead me to appreciate Dave’s message on a different level and just like the conversation that I crave after reading a good book, the discussions after his presentation had me reflecting, questioning and challenging my previous ideas. In his fast-paced 2 hour performance, Dave inundated his audience with magic, memorable hooks, meaningful quotes and most importantly, moments where his voice slowed and paused and we all listened just a little more intently as he shared why it is imperative that we “Teach Like a Pirate”. Unlike our first visit, this time Dave was able to join us for lunch and then a Q&A with a few team members. 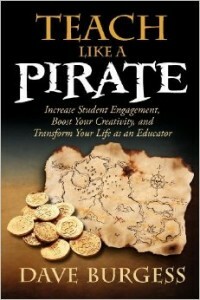 He was asked to reflect on his journey from teacher to Pirate to Presenter to Publisher. We appreciated his deep reflection and honesty about the challenges of maintaining the integrity of the classroom and meeting the demand for personal appearances. As I watched the same execution of punch lines, the same taboo teasers and the same intentional instructional strategies woven into raw steaks and a deck of cards, I gained a deeper appreciation for Dave, the educator. This is a teacher who knows his curriculum (common core in the U.S.) inside and out and he preaches (as if he’s on a pulpit) that in order to reach your students on an academic level, you need to know them as people first and get them into your classroom as you provide them with an experience ~ not a lesson ~ a well-crafted, intentionally embedded in curriculum and engaging experience. Three years ago, my favourite Pirate line was “It’s not meant to be easy, it’s meant to be worth it”. And regardless of anything that I’ve read, written or experienced in the last three years, that line is still my guiding principle. If you’ve read the book or experienced Dave in person, what is your most memorable quote?